The traditional God was a human-created myth that is no longer needed, and any debate over God’s reality needlessly wastes time and energy, and leads to conflict. Better to just leave it behind. I’m down with that, as far as it goes. My hang-up is over the need to ponder “spirituality.” Can we not give up that as well, and just get our “awe fix” by trying to comprehend the wonder of a leaf or of Earth’s orbit around the sun? Even though leaving behind the debate over god’s reality is important to post-theism, leaving god behind is not, since the meaning of god (as a metaphorical construct) is what needs to be properly understood and incorporated rather than simply discarded on our way forward. It’s the baby-and-bath-water thing again. The dirty bathwater is all the toxic convictions generated in defending and denying god’s literal existence, which has come to obscure the baby still in there somewhere. That’s why changing our question from existence to significance – from “Does god exist?” to “What does ‘god’ mean?” – helps us appreciate where post-theism transcends the debate and opens a path through theism. But isn’t post-theism just a matter of breaking free of theism, being done with the debate over god’s existence and perhaps done with religion altogether? Why then do I insist on holding on to spirituality? For my friend, I suspect it sounds too much like religion all over again. If we say we’re done with that, let’s just leave it behind and get our “awe fix” – love the term! – by contemplating nature and things that definitely do exist. An “awe fix” sounds like something we have a persistent need for, so what is that need all about? I happen to know that my friend is deeply fascinated with cosmology and the evolution of our universe. He certainly wouldn’t be alone in having an occasional seizure of existential astonishment over the provident marvels of Earth and her starry heavens. No doubt, it is that same radical amazement that must have inspired the earliest stories, songs, and dances of our species that got bundled up as mythology so many millenniums ago. To name this susceptibility to wonder, this sensitivity to being caught up in rapturous awe over the present mystery of reality, spirituality, is for me an acknowledgment that such experiences resonate in the human nervous system. They are not merely speculative wonderment over what we don’t yet know, or wide-eyed stupefaction in a brain too small to take it all in. In other posts I have named it our spiritual intelligence (SQ), and in recent decades ample evidence has validated its crucial contribution to our overall wellbeing. What follows will be an attempt to answer my friend’s question regarding the relevance of spirituality and why we can’t just pitch it out with the bathwater. In my view, spirituality and spiritual intelligence are unique to our species. I say this because it represents our further development beyond the formation of a separate center of personal identity, or ego. As far as we know, ours is the only species in which consciousness has evolved to the point of bending back upon itself in the fully self-conscious actor. It’s not difficult to anticipate the survival advantages of such an evolutionary achievement, as the individual is now malleable by the group as never before. This significant breakthrough made possible both the construction of social identity and the transmission of culture – advances found only in humans and crucial to our progress. But with this evolutionary value-added came a significant vulnerability. The center upon and around which the social engineering of personal identity takes shape stands in a unique design space, strategically separate from the individual’s animal nature (body) and separate as well from other egos, all at different stages of construction. Each self-conscious actor (ego) is instructed by the tribe and provided roles to play, which is where our word “person” derives from – the Latin persōna referring to a stage actor’s mask through which (per) she would speak (sōna) her part. When the family and tribe are healthy systems, this vulnerability is answered with responsible attention and nurturing care. But over the millenniums, as the human social experience has become more complicated and unsettled, these systems have fulfilled their task less well. The consequence is that the individual personality has grown increasingly neurotic over time – more insecure, anxious, and out of balance. To compensate, the neurotic ego grabs on emotionally to whatever (or whomever) might stabilize and pacify its insecurity. This is what I name neurotic attachment. In addition to clutching these emotional pacifiers, the individual will also engage in various strategies of manipulation in order to get his or her way. Such cycling back and forth between attachment and manipulation can keep the neurotic ego busy for a lifetime – or several lifetimes, if you believe in that. Actually, this is exactly where authoritarian, repressive, dogmatic, and exclusive forms of religion can take hold. The insecure and insatiably neurotic ego desperately needs salvation – an escape to immortal glory – and such sick forms of religion promise to provide it. And if what I’ve said so far makes sense, then this is also where we can best understand what an active spirituality has to offer. In this diagram I have pushed the neurotic cycles of attachment and manipulation apart, just so we can keep them in the picture. The tricyclic structure in the middle is intended to illustrate a healthy spirituality – remembering that we are talking about a distinct thread or frequency of human intelligence (SQ) and the new dimensions of awareness and experience it opens up for us. Now we can see that where the neurotic ego struggles most is in the dynamic balance of love and power which characterizes every relationship. This balance can be further analyzed into the ability of partners to share what they have with each other, to give to the relationship what it needs to be healthy and strong, and most fundamentally to trust themselves, each other, and the relational process itself. The ability to trust is directly a function of how centered, grounded, inwardly secure and fully present an individual is. These qualities together serve as my best definition of inner peace, which is the essential state of a peaceful soul. Here, then, is the first part of my response to the question of why we can’t simply dismiss spirituality in our criticism of theism and its god. Our spiritual intelligence is what opens consciousness to the grounding mystery within, to that mystical place below personal identity, relationships, and worldly concerns, where we can effortlessly relax into being. This deep center of quiet calm is what supports the ability to trust oneself and another, and to share what we have with others. 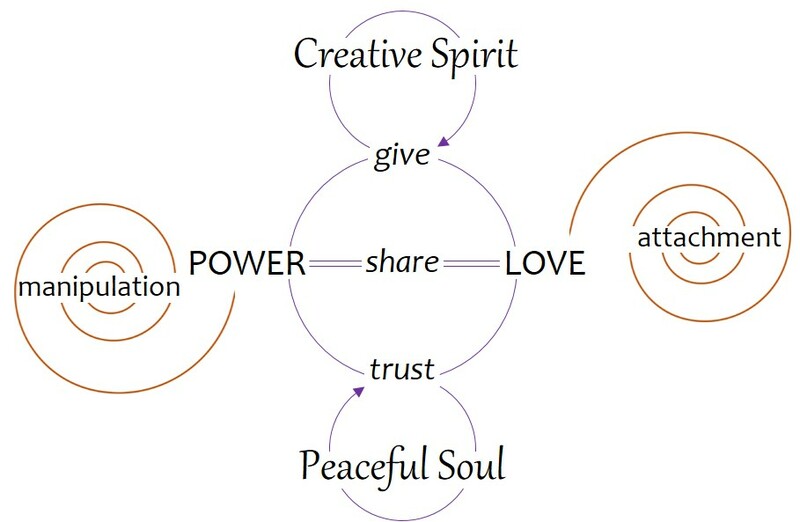 The interactions of trust, share, and give in turn name the distinct ways that spirituality expresses itself outwardly. In many languages the metaphor of spirit (breath, wind) carries the idea of movement, freedom, and creative transformation. While the peaceful soul is spirituality’s deep inner wellspring, the creative spirit is its outreaching influence in life and the world around us. Indeed, as a construction of meaning, the world around us is its crowning achievement, called into existence “in the beginning” (Genesis 1) of each new day.